ACM Gold has reigned as Africa’s only forex trading company since its founding in 2004. The authorized financial service provider has won Best Broker in Africa for three years in a row, enjoying the spotlight on CNBC, in Entrepreneur, Forbes and Business Day. With 118 employees working out of six offices across the globe, the company sets itself apart by providing streamlined financial services along with insightful educational materials to its more than 30,000 clients. 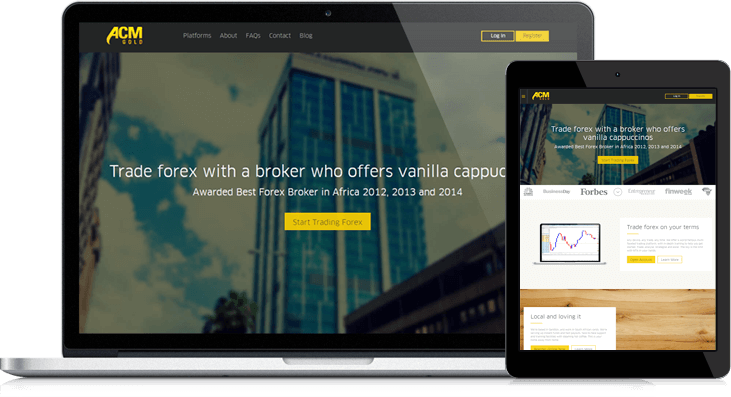 Founded in 2004, ACM Gold had achieved status as a celebrated, award-winning forex trading company in Africa. But while the company looked great in front of the cameras, it found itself drowning in a sea of website and marketing complexities behind the scenes. The authorized financial services provider needed a way to consolidate, organize and streamline its various tools, content, departments and marketing strategies on a single platform. It also needed a way to customize the platform to meet the unique needs of its clients and industry. ACM Gold first chose HubSpot as its unified marketing platform. It then hand-picked LyntonWeb to guide its HubSpot implementation and customization strategies. The result was a wholly redesigned website integrated with inter-departmental tools that were used to track, measure and build upon ACM Gold's existing success. Although ACM Gold's updated marketing platform houses a multitude of complex functions and tools, the website itself was simple. Simple and supremely user-friendly. Within 16 months of launching, ACM Gold’s redesigned site enjoyed a 70% increase in website visitors, along with a 40% increase in conversions. While ACM Gold reigned as Africa’s only forex trading company since the company’s inception in 2004, the authorized financial service provider strove to set itself apart even further. It envisioned combining financial service offerings with streamlined technology, insightful educational materials, forex-specific information coupled with a personal touch. But such a combination was hard to track and maintain when things were scattered behind the scenes. The firm yearned to consolidate all tools, marketing, product and board functions into a single platform. So they signed up for eight or nine different platforms to give each a go. “Some failed as they were implementing,” said Fahd Nassr, Head of Products referring to various tools that were tested. A newly hired marketing officer started using the trial version of HubSpot in 2014, and the firm was hooked. “HubSpot is more than just a CRM,” Fahd said, explaining how they tried integrating everything through HubSpot, from AB/testing to automation, from blogs and emails to reporting data – even phone calls. “We liked the idea of having everything in one place,” Fahd explained, but that one place still needed specific customizations to suit ACM’s exact needs. That’s where LyntonWeb came in. Lynton filled ACM’s bill on several levels, particularly for its ability to customize and its status as a COS-certified, Platinum-Tier HubSpot partner. Pricing was a major factor, as were a series of various discussions and negotiations with Lynton’s CEO, Daniel Lynton, and Director of Operations, Tommy Butcher. “We used the relationship building method,” Fahd said, stressing the importance of partnering with people you can trust. By its very nature, forex trading and the financial services it requires are complex. The same holds true for trading information, client management and the multiple functions AMC Gold wanted its website to provide. The first challenge was effectively combining, consolidating and fine-tuning the array of complex everything into a simple website. ACM achieved simplicity by choosing HubSpot, and then Lynton dove into the customization of the site that delivered what ACM needed. Lynton broke down the full website redesign master plan into several phases, addressing SEO, content, design, development, required changes, and inbound marketing strategies. One of the site’s major goals was to help usher in qualified prospects through the use of content, ongoing email marketing and paid campaigns. Another was to create a custom style for the external login function, giving registered users a seamless transition they would perceive as one experience. A third was to provide rapid, thorough responses the most common platform questions. Lynton conquered this feat by integrating Swifttype custom search into the website for an efficient search based on keywords and categories. The plan was to have the new ACM Gold site up and running within five weeks. Lynton nailed it. ACM’s wholly redesigned website was launched in March 2015. In the 16 months since the redesigned website has been up and running, ACM Gold has witnessed an amazing difference. Not only are leads more rapidly pouring in, but more of those leads are converting, with a 40 to 50% increase in conversions since the launch. But it’s more than just the statistics that impress Fahd; it’s the overall competitive advantage ACM Gold continues to gain with Lynton Web’s help. What does work has been working so well that ACM Gold has since begun working with LyntonWeb on three different websites owned by the parent company. And LyntonWeb will continue using HubSpot and its expertise to build sites that are friendly for users, effective for companies and otherwise regarded as a complete success.